John lived in Russell Township, Putnam County from birth to early 1900’s and Indianapolis, Marion County from 1905 to 1914. He later moved to Allegheny County, Pennsylvania. John was a carpenter and built houses in Indianapolis. He served in the 503 Aero Sq. Air Svc. in World War I. John and Daisy were divorced. This entry was posted in Marion County, Putnam County and tagged Ball, Beeldt, Burnside, Faulkner, Homan, Maxwell, Nicholson, Slider on April 24, 2015 by oahblog. Maurice was a baker. When he first went to Dayton, he worked at the White Baking Company breaking horses for the delivery routes. He then went to Minneapolis to work in the large mills. He continued to work in the baking industry in both Columbus, Springfield, and Dayton, Ohio, where he owned several bakeries and restaurants. He was also owner of Maurice E. Nicholson Bakery Supplies. Maurice was a member of St. Paul Methodist Church in Indianapolis and Westminster Presbyterian Church in Dayton, Ohio. Maurice lived in Indianapolis from 1907 to late 1920’s. He later lived in Dayton, Ohio (1930, 1937-1947); Minneapolis, Minnesota (1931-2); Columbus, Ohio (1933); Springfield, Ohio (1935); Clayton, Montgomery County, Ohio (1947-1982). Maurice and Helen had four children. He never lost his love for his home state of Indiana. This entry was posted in Marion County and tagged Homan, Maxwell, Nicholson, Parmer on February 12, 2015 by oahblog. m. 25 Dec 1866 Buffalo, MO ? 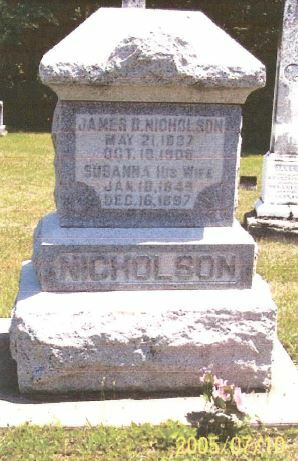 James D. Nicholson emigrated from Scotland in 1840. He arrived in Indiana in about 1842. 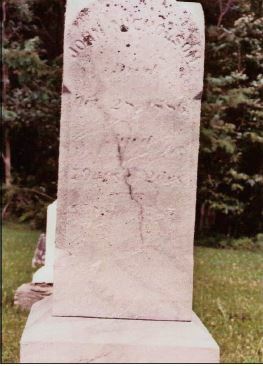 With the exception of two periods in his life – between 1866 and 1882 and between 1907 until his death in 1908 – he spent all of his life in Parke County, Indiana. This entry was posted in Parke County and tagged Bain, Burkholder, Day, Johnson, Minaul, Mount, Nicholson, Ratcliff, Rexrode, Riner, Williams, Wysong on July 16, 2014 by oahblog. John Nicholson emigrated from Scotland in 1840. He arrived in Indiana about 1842 and lived briefly in Morgan County, before settling in Greene Township, Parke County, Indiana for the rest of his life. This entry was posted in Morgan County, Parke County and tagged Bain, Bishop, Dickson, Murray, Murry, Nicholson, Porter, Pyle, Rexrode, Smith on July 16, 2014 by oahblog. Carmie Nicholson lived in Indiana most of her life. Although born in Kansas, her family returned to Indiana in 1882. She went to Albuquerque, NM in 1902 with her brother, who had lost his wife to tuberculosis. William Clarence Wysong followed her there and they married in Albuquerque. They remained there until 1903 and returned to Indiana in 1905. After William died, Carmie and their children lived in Oklahoma for the years 1907-1922. 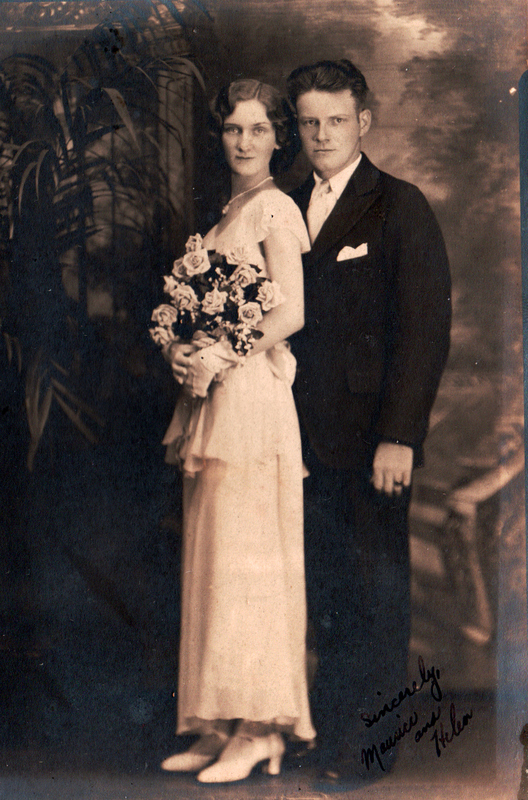 She married James Tabor in 1921 and soon after returned to Indiana, where she remained for the rest of her life. William Clarence Wysong lived in Indiana for most of his life. He was born in Missouri but his parents moved back to Indiana when he was about 2 years old. He married in Albuquerque, NM while living there from 1902-1903 and was again in New Mexico between 1905 and 1906. 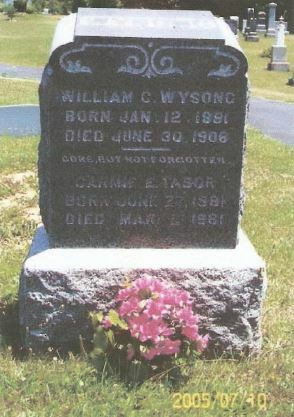 William died from typhoid fever and pneumonia on 30 June 1906 in Parke Co., Indiana. This entry was posted in Parke County, Putnam County and tagged Akers, Neelley, Nicholson, Oberst, Perkins, Rexrode, Wysong on July 16, 2014 by oahblog. Asa lived in Wayne and Union counties in Indiana. He emigrated from Indiana in about 1832 to Douglas County, Illinois. This entry was posted in Union County, Wayne County and tagged Lewis, Nicholson, Todd, White on April 13, 2014 by oahblog.